In dataloader.io, before actually importing the data you must first create an Import task. In fact, when creating the task you can save and run it, meaning that this doesn't add any extra steps. The beauty of doing things this way is that the next time you want to import the same kind of data, the task will already be created and it will just take you one click to get it up. You can also schedule these tasks to run automatically and forget all about them. If you want to build a new task that is similar to one you've already created,you can easily use an old task as a template and build from there, saving you several steps. Select your connection from the dropdown menu. Your login credentials will be your default connection. If you wish to use a different Salesforce connection from the one you’re using, create a new connection using the '+' icon next to the connection drop down. Select your operation type: Insert, Upsert or Update. Select the object you wish to import data into - e.g. Account, Contact, Lead, etc. You can use the "Quick find" function to search through your objects and the Menu button to quickly filter your Standard / Custom objects and show / hide your object names. You can import your file from your local directory or select it from a cloud repository. You can now map your CSV columns to your Salesforce fields. Any matching headers from your input file and your Salesforce object fields will be mapped automatically. Use the quick find on the top left to search through your source fields and find that elusive column from your file. 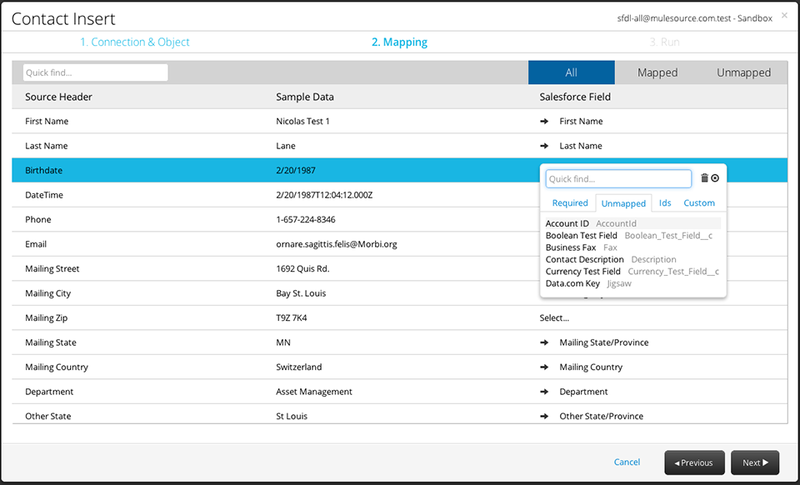 Use the quick filters on the top right to see all, mapped or unmapped fields from salesforce and quickly find if you are missing some important attributes. 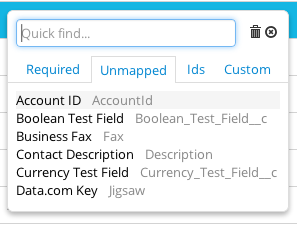 When cliking on a salesforce fields, use the "Quick find" function to search through those and use the quick filter tabs to find your Required, Unmapped, IDs & Custom fields. If you want to delete a mapping, just click on the trash can next to the mapped salesforce field. You can also map any source field into as many destination fields as you like. It's as simple as just using the Copy icon next to the source field name. If you need to remove a copy, just use the trash can the same way. In the following example we are using the First Name twice, once as the source field for a Lookup and also mapping it into the Contact's First Name. Up/Down - selects a field mapping to edit. Tab - cycles through: Field search, All, Mapped, Unmapped, field list (see below), Cancel, Previous, Next. When doing inserts make sure you have mapped all the required fields, otherwise you won't be able to move forward. When running updates you must map a column to the Object ID. For example, if you are importing Contacts, you'll find a field called Contact ID which must be mapped in order to perform the update operation. What if I don't have that ID from salesforce? Run an Export operation and retrieve those IDs from salesforce, attach those to your source file and re-upload the new file. 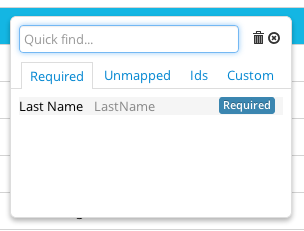 Use the lookup functionality to get the IDs based on another field, for example "Last Name" or an external ID. Doing an Upsert means updating the record if it exists, otherwise inserting it. When performing an upsert you must map a column to an ID field to be used as a key. You can either use Salesforce IDs or external IDs with upsert operations. An external ID field is simply a field which is a unique identifier for your record, other than the Salesforce Id, usually coming from an external system. For example, if you are importing accounts, you may have a field called 'ERP Account Number' which is the identifier for your Accounts inside your ERP system. If you need an object ID, but don't have it, you can use the lookup function to retrieve it dynamically. For example, if you're importing Contacts and you have the "Account name", but not the "ID", you can use the lookup feature to find it. On the last step of the wizard you’ll find the summary screen with the boiled down information for your task. On this page you can change your task name or choose whether to use the Bulk API or the Batch API (with a certain Batch Size). On the lower part you can also get access to the advanced settings. Finally, click Save to save your task and run it later or click Save and Run to save your task and run it immediately. You can Schedule your tasks so that they start running regularly. You can choose between Hourly, Daily, Weekly or Monthly schedules and switch to different time zones. Salesforce Bulk API is based on REST principles and is optimized for loading or deleting large sets of data. Records are processed asynchronously by submitting batches which are processed in the background by Salesforce. Bulk API has some restrictions, for example: related objects exports are not supported by this API. On the other hand, Bulk API processes data in larger batches than Batch API, resulting in a lower API calls usage per operation on large volumes of data. Whenever the Bulk API checkbox is left unchecked, the Batch API is in use. Salesforce Batch API is based on SOAP principles and is optimized for real-time client applications that update small numbers of records at a time. Although SOAP API can also be used for processing large numbers of records, when the data sets contain hundreds of thousands of records, it becomes less practical, in those cases Bulk API is the best option. Batch API processes data in smaller batches than Bulk API, resulting in a higher API calls usage per operation on large volumes of data. You can set up your task so that an email notification is sent to you whenever it runs. You can add multiple recipients as well as multiple cc to the sent email. When using the free edition of Dataloader.io, you are only allowed to have one task set up to send email notifications. Dataloader.io Professional and Enterprise Editions allow you to implement these in an unlimited amount of tasks. Available for both Bulk and Batch APIs. This option allows you to select your import date format, choosing between American (MM/DD/YYYY) and European (DD/MM/YYYY) date formats. Available for Bulk API only, this mode guarantees that batches are processed one at a time in Salesforce (avoiding possible database contention). Be careful, this option may significantly increase the processing time for a load. Timeout allows you to set a limit to the maximum time a task can keep running. When the task reaches the timeout threshold it will be cancelled automatically. The default timeout set by the system is 2 hours. If this is box is ticked, whenever you're updating an existing registry and the new version contains fiedls with null values, these will overwrite the old values of these fields. If this option is not checked, null values in the update will be ignored and the old values for those fields will be preserved. © MuleSoft, LLC. All rights reserved. Salesforce is trademark of salesforce.com, inc. and are used here with permission.